Last month Bridgeport Mayor Bill Finch remarked on Obama’s visit and the mayor said “We’ve hosted 100 or so Presidential visits in Bridgeport’s history, and we’ll host 100 more, God willing.” Well, it hasn’t been that many, but surprisingly Bridgeport is a popular stop for American presidents especially around election time. 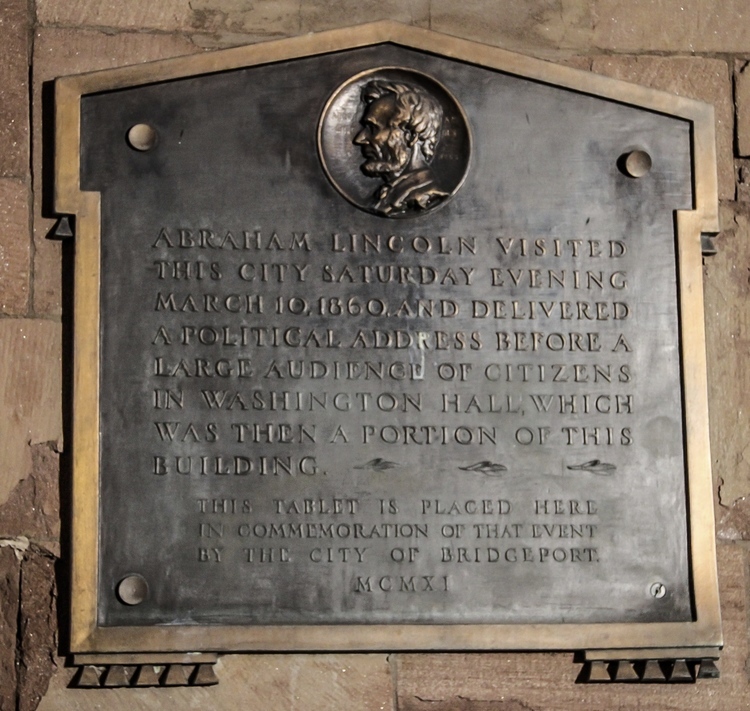 16 American Presidents have visited Bridgeport for a total of 31 separate visits – from George Washington to Barack Obama. 8 were Republicans, 7 were Democrats and one was an independent – George Washington. Here is a quick run-down. For some of these visits there are available details, for others we just have the date. 1. George Washington: If you were wondering why there are so many “George Washington Slept Here” signs on old New England buildings, it’s because he made a tour along the Post Road from New York to Boston in 1789 during his first year as president, and it is documented that he went through Bridgeport as well. 1 A. Although there is no documentation that I could find that Presidents John Adams nor John Quincy Adams came to Bridgeport, the fact that they had homes in Boston might indicate that they might have also traveled the Post Road through Bridgeport from Washington to Boston sometime in the late 1700’s to early 1800’s. 2. Abraham Lincoln: In March 1860 before he became president in 1861, Abraham Lincoln spoke in the auditorium at McLevy Hall. The largest room in the city was packed, and a crowd formed outside. He gave a 2 hour impassioned speech against slavery. Lincoln received a standing ovation before taking the evening train back to Manhattan. A plaque on the building marks the event. While in Bridgeport he ate at a home of a Republican constituent on Washington Avenue and it is said that there he had his first taste of New England fried oysters. 3. Theodore Roosevelt: In 1902, Roosevelt traveled through New England on a long tour. 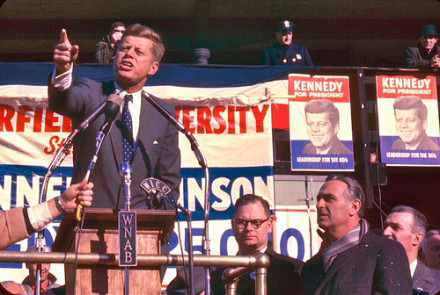 He stopped in Bridgeport and spoke to a crowd of 30,000 and he spoke out against the powerful trusts, trade with Cuba, taxes, and the Philippine rebellion. 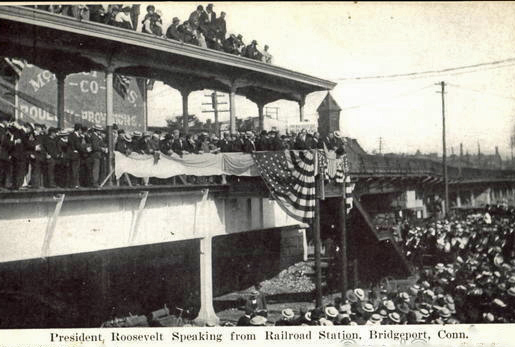 He also came to Bridgeport in June 1905. He visited after he was president in Nov. 1916 campaigning for presidential candidate Charles Hughes and spoke before a crowd of 5,000. He also blasted Woodrow Wilson and the Democrats in his speech. There is also documentation that he was here in 1919 and 1921 as well. 3 A. Mrs. Warren G. Harding Although there is no evidence that President Warren G. Harding visited Bridgeport, his widow did come here for the dedication of Harding High School in 1925. 5. Harry S. Truman: President Truman came to Bridgeport during his presidency in 1948; and came here again in Oct 1952 to rally the Democratic vote in CT. His speech included references to the Bridgeport Locomobile and Bridgeport’s Father Panik Village. 6. Dwight D. Eisenhower: Dwight Eisenhower was in Bridgeport during a campaign tour in Oct. 1952 right before he before president. 7. John F. Kennedy John F. Kennedy was here in Nov. 1960 before a crowd of 6,000 at the train station campaigning for president. He said in his speech that said CT was key state in the election and spoke on what he would do if elected president and on the war in Vietnam. He also came in 1962 as president. 8. Lyndon B. Johnson: Lyndon Johnson came to Bridgeport in Oct. 1963 when he was Vice President, 1 month before the assassination of President Kennedy. 9. 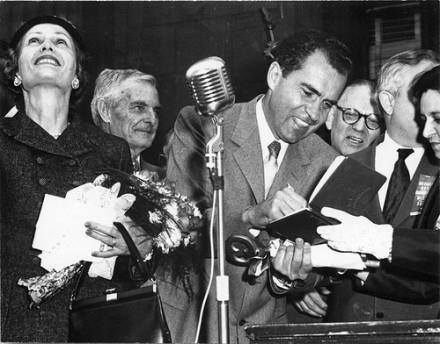 Richard M. Nixon: Richard Nixon makes a stop in Bridgeport when he was Vice-President in 1956. 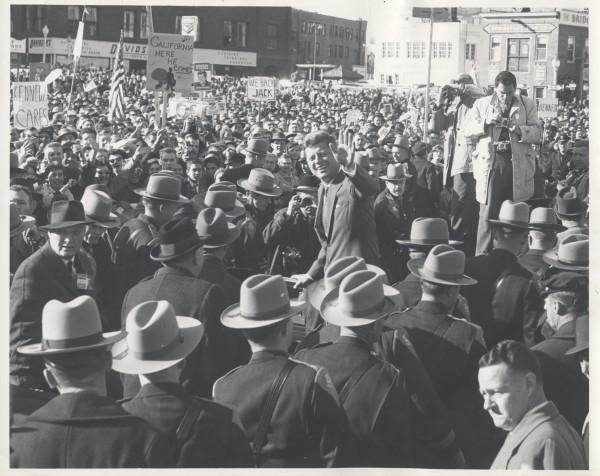 He returned to Bridgeport in Oct. 1960 during his campaign tour against Kennedy. He also visited while president in 1970 with wife Pat.  9 A. There is some documentation that both Gerald Ford and Jimmy Carter visited Bridgeport but I could not find the dates in my research. Carter was here a few times apparently. 12. Ronald Reagan: Ronald Reagan visited the General Electric plant in Bridgeport in 1954 before he was President when he was a spokesperson for GE. 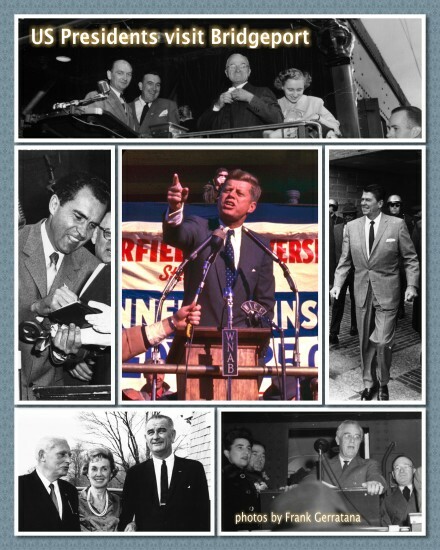 He returned to Bridgeport as president in Oct. 1984. 13. George H.W. Bush: Not in Bridgeport exactly - but George H.W. Bush visited Sacred Heat University in 1981 to receive an honorary degree. 14. William J. Clinton: Bill Clinton visited Bridgeport as president in Oct. 1994, and in March 1998 he returned to tour the Early Childhood School at Housatonic Community College and made a speech about early childhood education. 15. George W. Bush: President George Bush was here in April 2002 to talk about discussed voluntarism and his plans to expand citizen service programs in the U.S. 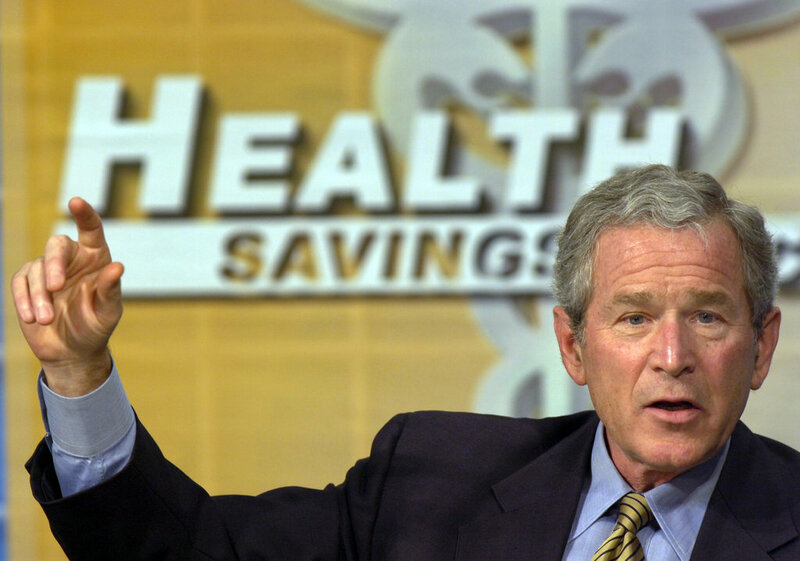 He returned in April 2006 and spoke at the Playhouse on the Green before a group of Connecticut business people about health care reform and to promote health savings accounts. He praised U.S. Rep. Christopher Shays and CT Gov. Jodi Rell. 16. President Obama President Obama came to the Harbor Yard arena in Oct 2010 and spoke before 9,000 people to gain support for the campaigns of Democratic Governor Dan Malloy. Richard Blumenthal for US Senate and Congressman Jim Himes. He returned of course on Nov. 2 of this here and spoke to 1,900 people at Central High School to once again gain support for Governor Dan Malloy. 17. Donald Trump was in Bridgeport in the 1990’s. He wanted to build the Trump Park City Plaza on the city’s Pleasure Beach with an amusement park, shipping terminal, retail and residential space. That never happened. Then he wanted to build a casino on property he owned that is now the Arena at Harbor Yard. That deal fell through of course. He came back to Bridgeport in April 2016 when he held a campaign rally at the Klein Memorial Auditorium.